The sleek design of the Spear & Jackson 1200W 34cm Rotary Lawnmower with rear roller should turn heads in your neighborhood. However, does the lawnmower rate above average in terms of performance? With a large 40-litre grass collection bag, consumers are off to a good performance start. You spend more time cutting grass and less time dumping grass clippings into a compost pile. 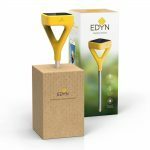 The grass collection bag includes a Full Collection Indicator that takes the guesswork out of dumping grass clippings, as well as a mulching option to produce extra fine clippings. Homeowners and lawn care specialists should use this lawnmower on small and medium size yards. Moreover, several reviews point to the lightweight design of the lawnmower as a hindrance over undulating terrain and wet lawns. The lawnmower also doesn’t stripe lawns as effectively as other types of electric rotary machines. Considered a bit heavy for its size, the lawnmower does include impact and corrosion resistant rugged plastic that mitigates the weight issue. East to assemble, the Spear & Jackson 1200W 34cm Rotary Lawnmower with Rear Roller includes a seamlessly integrated rear roller that provides some stability when you push the lawnmower horizontally on the side of hills. Height adjustments run through seven settings, which give you more cutting height options than most other types of electric rotary lawnmowers. Storage is easy, whenever you manipulate the quick release handle. The lawnmower comes with a detachable extension cable that allows you to switch between lawn care products. This feature works especially well for lawn care and landscaping companies that deploy multiple machines at one job site. 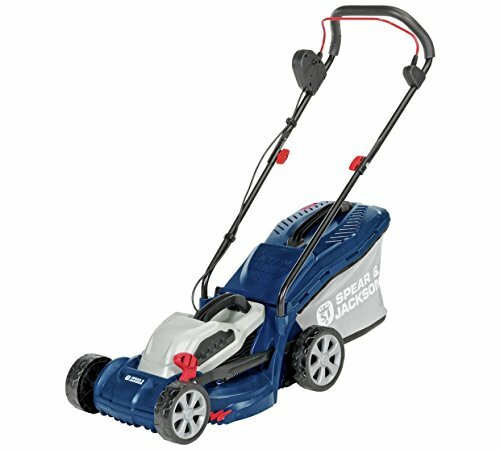 If you own a small or medium size property, then consider purchasing the Spear & Jackson Rotary Lawnmower. The large grass collection box and folding handles offer you lawn-cutting convenience. On the other hand, ineffective striping and the inability to cut up and down hilly lawns limits the lawnmower’s usage.